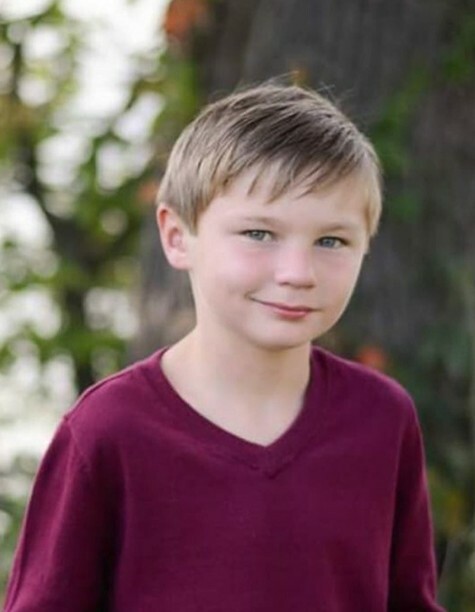 Blair R. Newlon, 8 years old, of Ida Grove, Iowa, formerly of Whiting, Iowa passed away Sunday, January 20, 2019 at the Buena Vista Regional Medical Center in Storm Lake, Iowa from injuries sustained from their vehicle going through the ice on Storm Lake. Funeral services will be 10:30 A.M. Saturday, February 2, 2019 at the Whiting Christian Church in Whiting, Iowa with Pastor Josh Weece officiating. A luncheon will follow the service before burial in St. Joseph Catholic Cemetery, Anthon, Iowa. A visitation will be 5:00 to 8:00 P.M. Friday, February 1, 2019 at the Church. Arrangements are under the direction of Rush Family Care Service, Onawa, Iowa. Blair was born August 4, 2010 in Sioux City, Iowa the son of Zackary Newlon and Erica Johnson. He was raised in Anthon and Whiting, Iowa until recently moving to Ida Grove where he was currently in the 2nd grade. Blair attended the Whiting Christian Church in Whiting, Iowa, where he enjoyed spending time with other kids and learning about Jesus. Blair was the “Man of the House” and enjoyed fixing things and helping his mom around the house. He enjoyed building projects with his Legos and going fishing. He loved Lightning McQueen from the movie “Cars” and playing video games like Pac Man. He was thrilled with a robot he received at Christmas. He protected his mom, two sisters, and brother, and always put them first. When the accident happened, he made sure his sisters got out first. His love for his family is undeniably the most terrific quality Blair possessed. Blair was a true superhero to the utmost infinity. His smile and affection for others are precious gifts that will live on in the hearts of those he treasured here on earth. Those left to cherish Blair’s memory are his mom, Erica Johnson; his two sisters, Sydney Newlon and Sophie Newlon; and one brother, Liam Johnson all of Ida Grove, IA; half-sister, Dannielle Book of Correctionville, IA; grandparents, Scott (Molly) Johnson of Harrisburg, SD, Lisa Wilson of Lenexa, Kansas, Randall (Vicki) Newlon of Anthon, IA; many great-grandparents; great-great grandparents; aunts; uncles; cousins; other relatives; and friends from school. He was preceded in death by his father, Zackary Newlon, who also passed away in the accident; two great-grandfathers, Roger Kinney and Vincent McDermott; and several other family members.